Abraham’s brother, Paul Enebeli, who spoke to PUNCH Metro, said Martins was hired by one Chukwudi. Paul said, “Trouble started early August when Abraham owed Chukwudi about N150,000. “Abraham said some people defrauded him; but Chukwudi brought six uniformed army officers to our house. “My brother was beaten up, my mum was injured and they attempted to take one of my brothers away. Some guys intercepted them. They threatened to keep coming back until my brother paid the money. “There was an agreement among Abraham, my elder brother, the soldiers and Chukwudi that since they injured a lot of people in the process of getting the money back, the money would not be paid back in full. They agreed that my brother would pay N85,000. “However, one of the soldiers kept harassing my brother. Yesterday (Saturday), the soldier was on a motorcycle with another friend, who knew my brother. “My brother and that friend greeted each other. The soldier called my brother, but he refused to answer. That got him infuriated. He got off his motorcycle and pushed my brother. 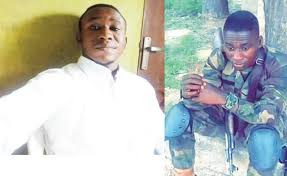 When PUNCH Metro contacted Chukwudi, he denied sending the soldier to Abraham, adding that the said money belonged to the military official. He said, “I was not around when the incident happened. The money is not mine; it belongs to the soldier. “I was at home some months ago when the soldier called me that he had some Amazon cards to sell and I told him that I had someone that traded in such things. “He gave me the cards and I gave them to Abraham’s elder brother, Solomon, to sell. The cards are worth N175,000. “When Solomon was to pay for the cards, I gave him the account number that he would transfer the money to, but he kept procastinating. “It got to a point that he stopped taking my calls. He later told me that he would transfer the money to Abraham, who would later transfer it to me. “After 30 minutes, Abraham called me that he was held by some SARS operatives when he was going to an ATM to withdraw and that they had collected the money from him. “I was surprised when he said he was going to the ATM to withdraw because what I told them was to transfer the money to my account. There was no agreement between us that they should pay N85,000. “The soldier was on mufti yesterday (Saturday) and I was told that Abraham talked to him anyhow. He hit the soldier on the chest, which got him pissed off. The Army Public Relations Officer, 81 Division, Lt. Col. Olaolu Daudu, promised to investigate the incident.